This is the sixth in a series of guest posts from select authors in Protagonize‘s creative writing community. Do you have something to say that might be of interest to our members? Feel free to contact us with blog ideas and share your passion for writing with our readers. Spring is coming, can’t you feel it? The days are longer, the blizzards are shorter, and once in awhile the sun comes out. Eventually the snow will melt, the grass will grow, the trees will bud, and the flowers will bloom. Until then, we can harbour Spring in our hearts, with poetry. That’s right, poetry. Don’t you want to get your poetic juices flowing like the sap in the trees? Don’t you want to nourish your muse with verse? Hiya, everyone. My name is Moonwalker, or Moon, if you like. I am thrilled to announce that I will be hosting the 2011 Spring Poetry Tournament. This will be the sixth tournament on Protagonize. Each one has evolved and grown from a small contest with eight competitors and three judges in the summer of 2009, to a full blown tournament with thirty competitors, and six judges. I will be following in the footsteps of such stellar hosts as ElzuWolfe, Archi_Teuthis, Rac7hel, smac972, and verse47. Each tournament has produced some of the most exceptional poetry I have ever read. The calibre of these poets have been astounding. There were beginning poets that didn’t think they had it in them to excel, but they surprised themselves. You too can excel, whether it comes as a surprise or not. This is going to be so much fun! The tournament consists of two parts: The pre-tournament, and the tournament itself. The pre-tournament is just for fun, and it only takes one week. There will be just one poem to write for each competitor. The poets will be split into groups, and each group gets to write about a different silly subject. Here’s a hint for one of the subjects: Unicorn horn whitening paste. Everyone is invited to join this pre-tournament. Competitors, non-competitors, or judges in the main event, are welcome. It’s a fun warm up, to amuse your muse, and get those verses pumping. The pre-tournament results have absolutely no bearing on the tournament itself. The 2011 Spring Poetry Tournament will start on March 6th, the day after the pre-tournament ends. It will have four challenges to complete, which will take four weeks. This will be a blind contest, meaning that the poems will be anonymous. The poets will send their poems to a poetry tournament email address. They will be posted anonymously on a tournament page, which will be set up for that purpose. 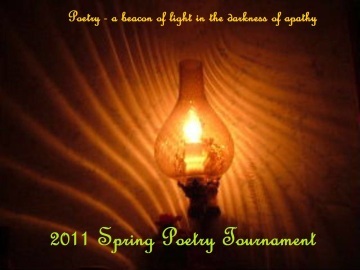 The 2011 Spring Poetry Tournament will run from March 6th – April 4th, 2011. Here’s something new and exciting about this tournament. There will be prizes! To find out more, all the details are on the competitors’ sign up page. Judging will be done in a private group format. There will be a group set up only for the judges. Membership will be by invitation only. The poems will still be anonymous, because no one but me will know who the authors are, and I’ll be supervising, not judging. I was part of the judging group for the 2011 Winter Tournament run by verse47, and it worked extremely well. Each poem will be discussed among the judges, based on certain criteria. If you’d like to judge, this is where you’ll find all the information you’ll need. Moonwalker has been a member of Protagonize since October of 2008. She lives in the Ottawa area, and spends as much time writing on the site, as possible. She co-hosted last summer’s tournament with ElzuWolfe, and learned a great deal from him. This year she feels confident enough to fly solo in the 2011 Spring Poetry Tournament. This entry was posted in Contests & Competitions, General, Guest Posts and tagged 2011, competition, poetry, seasonal, spring, tournament. Bookmark the permalink.